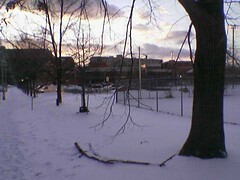 The Valentine’s Day winter storm of 2007 was mostly sleet and frozen rain here in DC: ice pellets rather than flakes, and all through the night I heard the high-pitched tinkling of crystals striking my windows. 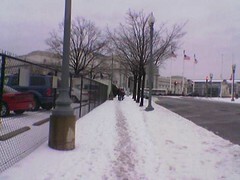 What settled on the streets and sidewalks seemed like snow at first glance, but it slumped where it rested, with a grainy consistency more like iodized salt than fluffy snow. 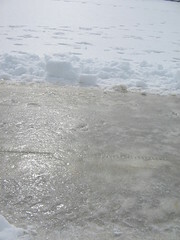 Walking on it was like walking on freezer frost, and after a day of thawing and a cold night of refreezing, the icy crust turned hard enough that you could walk on — and slide across — it without the ice breaking beneath your feet. Where it had not formed a crust, it instead formed muddy pools of slush, and on untreated and unshoveled streets and sidewalks it would be packed by throngs of feet and wheels into a rough, shiny, slippery sheen. Since the storm, one must be very careful walking about the city. 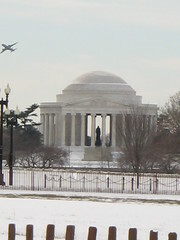 I traipsed around the monuments a bit today, to see how the popular public spaces of DC fare in the aftermath of an ice storm. 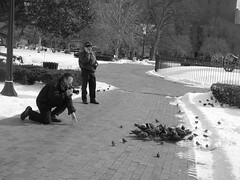 Lafayette Park, in front of the White House, was clean and well-plowed, heavy with tourists and photographers as always, though all were presently chased off by Secret Service for a VIP to pass through, probably the president. 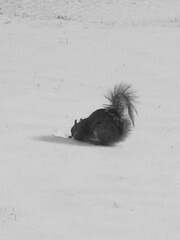 The squirrel digging in the ice, however, was allowed to stay. 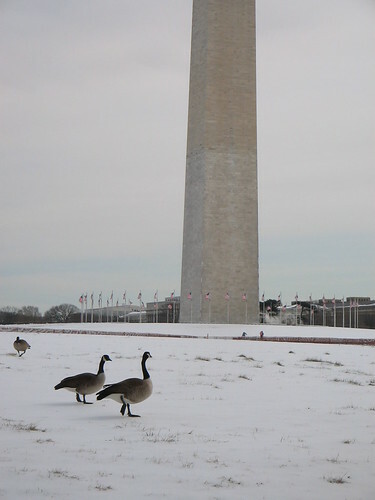 Large sections of the paths up to the Washington Monument, as well as the granite plaza encircling the obelisk, were covered with a dangerous layer of slippery refrozen ice. 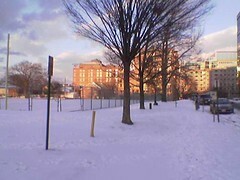 Atop the Monument hill a lovely wind was blowing, so strong I had to brace against it lest my jacket turn into a sail and send me skidding, iceboat-like, across the plaza. 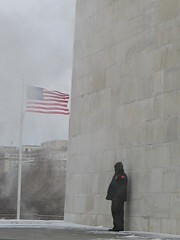 Against the monument wall a security guard stood, hooded and bundled, facing towards the Lincoln Memorial. 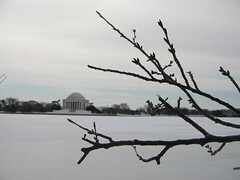 It was a bit of a slippery walk down to the Tidal Basin, which had frozen over almost completely. 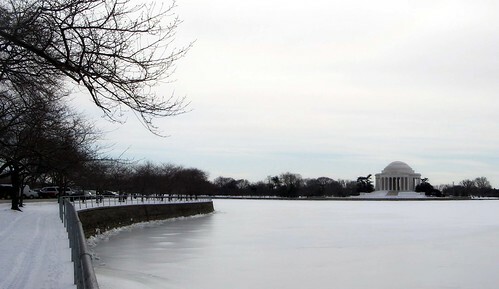 I didn’t bother walking all the way around to the Jefferson Memorial, as my feet had begun to ache from the stress of walking on winter ice; but I stood there for a few minutes, watching the ice slowly shift and and climb and crack along the walls of the Tidal Basin as the murky water water beneath it froze and expanded. Around me were the famous cherry trees, bare of leaf or flower. 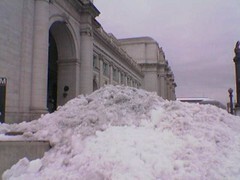 Hard to believe that in two months they will be bright with cherry blossoms. Walking back to the Metro to get to work, I saw geese.